Get to know the wonderful businesses that sell PRIIA! 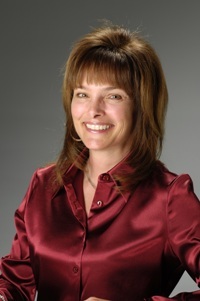 Congratulations to Kimberlee Hummel of Skin Spa Acne Clinic and Aesthetics! She is our first client to be featured in the PRIIA Business Spotlight! *As a side note, Kimberlee’s business just won the ‘Best of State’ in the Cosmetic/Medical Spa Category! 3. How long have you been in business? I’ve been practicing for 15 years. I’ve owned Skin Spa for 6 years. 4. What types of esthetic services do you offer? 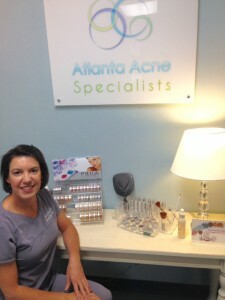 My main focus is working with acne clients and clients with aging skin. I do acne treatments, microneedling, chemical peels, facials, microdermabrasion, body sugaring, permanent cosmetics, and eyelash extensions. I also have significant experience with medical aesthetics, including laser hair removal, sublative laser treatments, and IPL. 5. Why did you choose to offer PRIIA to your clients? I firmly believe that makeup should be an extension of good skin care. 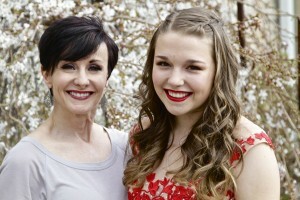 Makeup should add to the overall beauty and health of the skin with pretty, natural- looking coverage. I had a small line of mineral makeup that I wasn’t totally happy with. 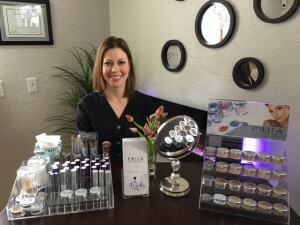 When I heard about PRIIA in the summer of 2014, I contacted Kelley and she told me she was reformulating products so that everything in the line would be acne safe. This was appealing to me as my acne business was quickly growing. 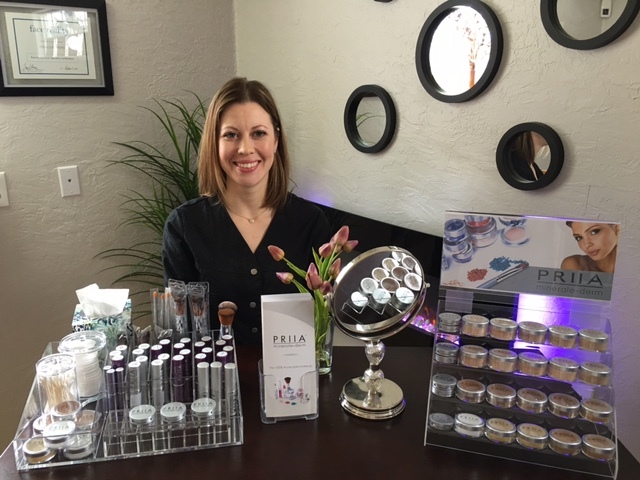 She also told me about all of the incredible anti-inflammatory ingredients PRIIA products would have and that it would be wonderful for my aging clients. 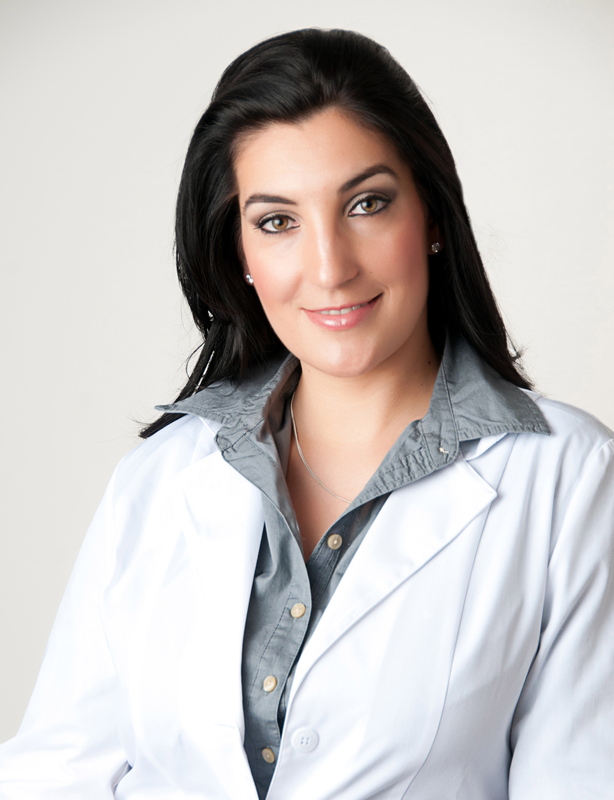 Most of the work I do is more clinical in nature – including lots of microneedling and chemical peels. I needed a product line with high quality ingredients for healing skin that also had buildable coverage. I placed my first PRIIA order in October and I was so impressed with the products when I received them. 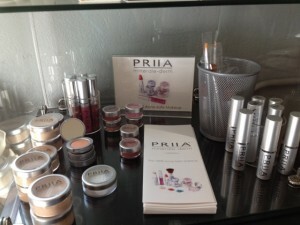 I absolutely love what’s not in PRIIA products as much as I love what is in them. The customer service from PRIIA is stellar. Brining PRIIA into my business was one of the best decisions I’ve ever made. 6. 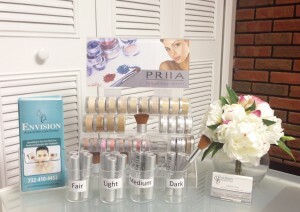 What is your favorite PRIIA product and why? Do I have to choose just one???? I absolutely love the foundation. Both the crème stick and the loose minerals are beautiful. I’m partial to the loose minerals. I was a makeup artist for bareMinerals for a few years and I think high-quality loose minerals are one of the versatile foundation options for all skin types and conditions. I have the custom blending kit (actually I have 2 of them). The finish of the loose minerals is just so pretty. It’s luminous, but not shiny. I’m 50 years old and people keep asking me what I’m doing differently with my skin and the only change I’ve made in the last 6 months is I started using PRIIA. I have to admit I was a little intimidated with the custom blending kit at first because I had zero experience blending. It sat on my shelf for a few weeks untouched, and I actually called Kelley for a little pep talk. I was successful at blending the very first time. The kit makes it sooooo easy. I’ve made a couple of mis-steps blending, and they were very easily fixed. 7. What do your clients think of the PRIIA minerale-derm line? My clients absolutely love PRIIA. I had one client tell me she’d “never where that bareMinerals crap again”. Another was so excited when a sales person at Sephora told her how beautiful her foundation is and asked what brand it is. One of my acne clients wasn’t clearing because she was using makeup from the drug store. Every time she came to my clinic, I removed layers of creamy, cakey makeup (uuuggghhh!!!). I finally got her to try PRIIA. She sent me a text the next day amazed at how thoroughly it covered her healing acne and so pleased with the finish. Yes – her acne is finally clearing just as I expected it would. I could just go on and on with PRIIA success stories. Clients of all ages are delighted with the product. 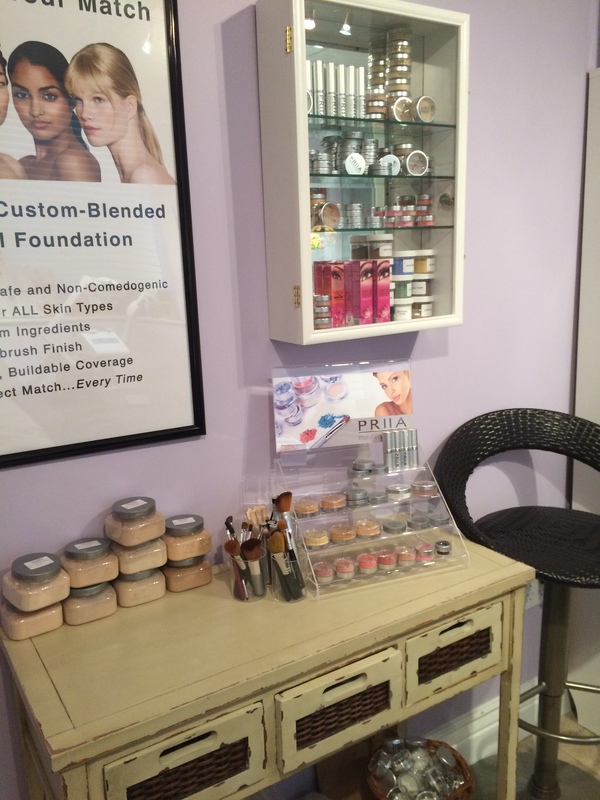 This entry was posted in PRIIA Business Spotlight and tagged beauty, PRIIA, PRIIA Cosmetics on April 8, 2015 by Kelley Maddison.